Insomnia cases have quadrupled, and sleep apnea cases have increased five-fold in the U.S. military over a decade, according to a recent study. Rates of these two sleep disorders among service members are now about double those seen in the general U.S. population, the study team writes in the Journal of Sleep Research. “Sleep disorders are a serious problem that interferes with the ability of soldiers to do their jobs effectively,” said senior study author Harris Lieberman of the U.S. Army Research Institute of Environmental Medicine in Natick, Massachusetts. The rising rates of military service members experiencing insomnia and sleep apnea over the past decade could affect operational readiness, wellbeing and healthcare costs, Lieberman’s team writes. About 10 percent of the U.S. population experiences insomnia – trouble falling asleep or staying asleep – or obstructive sleep apnea, in which a person’s airway collapses multiple times during sleep. Both complaints are also rising in the civilian population, the authors point out, according to data from the National Health Interview Survey. 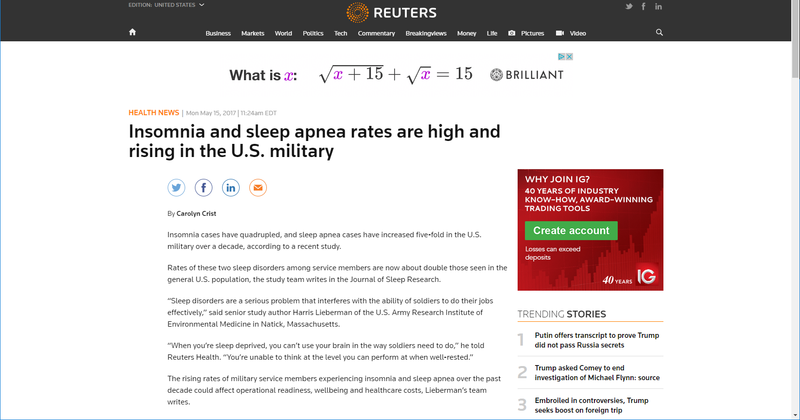 To investigate rates of insomnia and sleep apnea in the military, Lieberman and colleagues looked for cases between 2005 to 2014 in the Defense Medical Epidemiological Database, which keeps records of the medical encounters of active duty military personnel. They found that medical visits for sleep apnea increased from 44 per 1,000 people per year in 2005 to 273 per 1,000 per year in 2014. Visits for insomnia increased from 16 per 1,000 per year in 2005 to 75 per 1,000 per year in 2014. Obstructive sleep apnea was more common than insomnia throughout the time period, and the rates of encounters for apnea rose 3.5 times more than did rates of insomnia. In general, insomnia rates were higher among women, African Americans, people over age 40, enlisted personnel and in the Army, compared to other military branches. Obstructive sleep apnea rates were highest among men, African Americans, senior officers, Army personnel and those over age 40.